After a long, hot summer your turf is probably ready for a little extra TLC. Applying the right fall fertilizer will help your lawn grow stronger, resist disease and return healthier in the spring. The first step to a successful fall feeding program is decoding the fertilizer formula. A fertilizer’s formula blend is printed on the bag in a three-number format, such as 5-15-5. These numbers indicate how much Nitrogen (N), Phosphorus (P) and Potassium (K) are present in that blend of fertilizer. It is also important to pay attention to the release type. Fertilizers will often be labeled as slow-release or fast-release. The type you use will make a difference in how your lawn reacts to the application. For a successful fall feed, it is best to have a few different varieties of fertilizer on-hand, so you can adapt the formula as the temperature drops. During the month of September your lawn will do best with a slow-release, high-nitrogen formula. 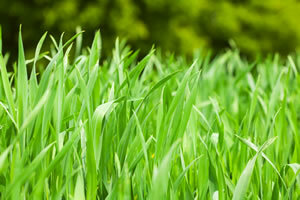 The nitrogen will help green up the lawn by promoting blade growth and repair damage caused by the summer heat. Once the weather cools, the grass will slow or stop growing. The most important time to apply a fall fertilizer is after growth slows, but before the first big freeze. This is usually around November or early December. For this later season application, choose a formula with a fast-release high-nitrogen and high-phosphorous blend. Phosphorous infiltrates the roots of the grass, helping to build a strong network that will be disease resistant and produce healthier grass when it beings to grow again in the spring. The fast-release formula will allow the nitrogen to be pushed into the lawn before the ground freezes up. If you want to get even more precise with your fertilizer blend, you can test your soil to see what it is lacking. Soil test kits are available over the counter at any of the Country Stores. Ensure successful application by carefully calculating the amount of fertilizer you use (check the bag for instructions), and calibrating your spreader to distribute it evenly and correctly. Prepare early for your fall lawn-feeding program by purchasing fertilizer while it is on sale, starting September 10th at the Country Stores. If you have more questions about fertilizing your lawn, feel free to visit us and ask a store associate for help.